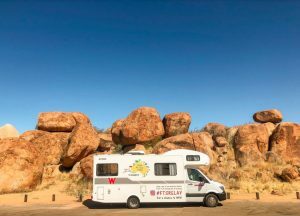 Join Ellen and Les as they make their way from Alice Springs to Darwin in their Winnebago Motorhome on the next leg of the Follow the Sun relay, which is also sponsored by Dometic. Ellen is a musician and has performed all over Australia, so her guitar came along. Les is diesel mechanic and loves to fish, go 4W driving and the outback. To read about Ellen and Les on their Dometic – Follow the Sun journey, click here to view the full article in Issue 24 of the What’s Up Downunder Digital Magazine.